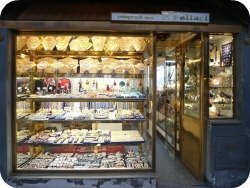 Gold jewellery is one of the most sought after items in Florence. The city has some of the country’s best goldsmiths and of course the gold dealers on the Ponte Vecchio are world famous. Objectively speaking, the quality of gold jewellery in Florence is very high. Italian gold is 18 carat, not 10k or 14k as you often find outside of Italy (you may find 10 and 14k in Florence, but it’s there mostly for tourists). 18k gold costs more, but is more valuable, softer and a deeper color. BTW, since 18k gold is 75% gold and 25% other metal, in Italy it's written as '750' on the back of pieces - and not 18k - so that's what you need to look for if you want to check for authenticity. Buying jewellery is a highly personal choice since ‘beauty is in the eye of the beholder’; only you can decide what you like and how much it is worth paying for. However, some gold shops in Florence are notorious for inflating their prices. If you just want to find out the names of some recommended shops click below. 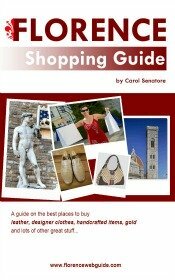 Otherwise, keep reading for a mini ‘buying gold in Florence for dummies’ guide. If you’re planning on investing in jewellery a useful thing to know is the market price for gold. You can easily google it to find out the rate at the time of your trip (a useful site is also www.goldpricenetwork.com). At the time of this writing the market rate was €28 per gram for 18k gold. This is the starting point but of course you have to add mark-up costs like store overhead and labor costs. So, retail prices may start at double the market rate (but that’s an extremely good price) and go up to 3, 4, or even 5 times more. One rule of thumb is: the heavier the piece, the less you pay per gram. For example, a gold piece that weighs 6 grams might go for €75 per gram, whereas a piece weighing 15 grams could go down to around €50 per gram. The Ponte Vecchio – as you might imagine – has some of the highest prices per gram in Florence. To be fair, it must be said that rent for shops on the ‘Old Bridge’ is exorbitant, so a mark-up has to be expected. Some shops are really extreme in their mark up though! However, if you are particularly keen to buy from a shop on the bridge, and to know that your piece is ‘from the Ponte Vecchio’, don’t despair - some shops do have prices that are fair (see addresses below). Weight has always been a criteria for pricing gold, although nowadays prices are not based solely on weight but on the amount of work needed to produce a piece. Some stores however say that it ‘isn’t their policy’ to weigh gold pieces. From my experience, these are often the shops which have the highest prices (110 and 150 euros per gram!). A professional gold-dealer will readily provide you with the weight of a piece – beware of those who say it ‘isn’t their policy’. Another thing to be aware of is that there is a ‘game’ that is very common in gold shops in Florence. The shop quotes a price for a piece, and then says ‘but that’s the price BEFORE the discount, let me see what it comes to AFTER the discount…’ , then they start punching at the calculator and say ‘so the final price is ….’. This system makes customers feel that they are getting a deal (it happens in Florence leather shops too…). Yet, there are shops that don’t put on this ‘show’ and their prices can be just as low, or lower, than the final price of these ‘discounter’ shops. I’m not saying that you might not get a decent final price at these shops, but once you know about this trick I think you’ll be better able to comparison shop. The bottom line should be the price per gram if you want to compare prices from one shop to another for a similar piece of jewellery. So What's a Good Rate? 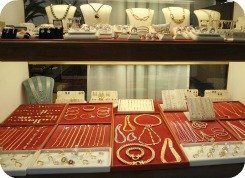 From my comparison shopping, I saw that the majority of shops were selling gold jewellery at between 75 to 85 euros per gram, so about 2.5-3 times the current market quote of €28 per gram. 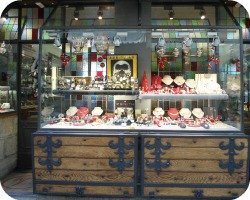 The Vaggi family have been gold dealers for three generations and have 2 boutiques on the Ponte Vecchio. The owners and staff are extremely professional and helpful and the prices are very fair. 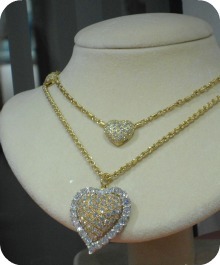 At Vaggi you can find both modern types of gold jewellery as well as antique styles. The shop has a very large selection of pieces, from simple to elaborate. 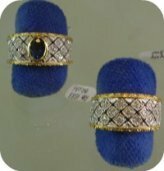 Vaggi are also retailers of the prestigious ‘Buccellati’ brand of jewellery, famous for its lace-work design with stones. The back section of the store is dedicated to these unique pieces. Fallaci is a small shop with non-inflated prices. 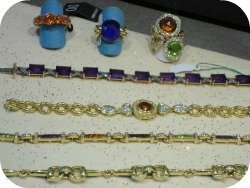 The shop has a nice selection of contemporary pieces as well as antique Florentine style gold jewellery. The service is professional and no-nonsense (they don't try to 'woo' you as in so many of the other gold shops along the bridge). You can also find a variety of cameos, representations of Florentine symbols (e.g. the giglio lily flower and the fiorino coin), and small collectors items such as miniature portrait pendants. This is a lovely small jewellery boutique that is unassuming and simple – no air of ‘Tourist Trap’ at all. Brother and sister run the shop and are pleasant, helpful and professional. With very little fanfare (no pulling out of calculator to tell me about the great discount I was going to get…. ), I was quoted €60 per gram for a very pretty 18k gold link bracelet – the lowest rate I’d found. This shop is different in that the owners are not only gold dealers but also artisan goldsmiths who design and produce their own pieces. 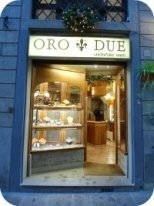 At Oro Due you can find lovely hand-made gold jewellery in modern but also Florentine renaissance styles. The workmanship of the jewellery here is first-class and pieces can even be made to order according to customer specifications. The pieces in the Florentine tradition are magnificent such as hand-hammered gold dangle hoop earrings and rings set in white or yellow gold with diamonds or other precious stones (see pics below). Other hand-made jewellery inspired by Florence are beautifully made rings, pendants and earrings with the image of the fiorino coin or the giglio lily flower. Knowing that the people who are assisting you in the shop are the same folks who actually made the jewellery is a unique feeling that adds authenticity to any gold purchase. 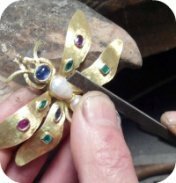 Apart from the fact that these guys really know their stuff and can tell you all about how the pieces are made, the jewellery - not being produced on a large-scale - is more original with some one-of-a-kind pieces. 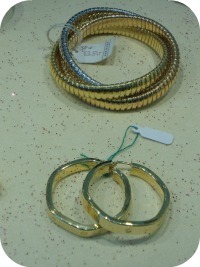 Oro Due has small items in silver and gold starting from €50.